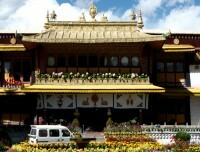 Overland Tour to Tibet starts from Kathmandu. It is 7 nights 8 days tour known as group joining and Budget tour to Tibet. Tibet Kailash Travel operates this tour Everest Saturday throughout the year accept March month. 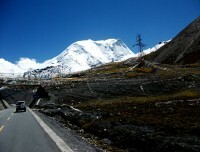 Tour is driving in first from Nepal and flying out from Lhasa Tibet. 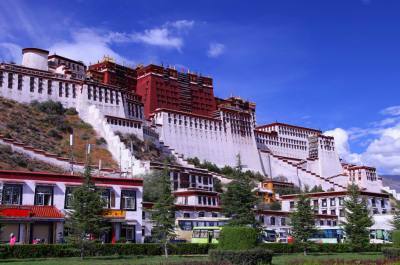 It is option to travel further to mainland china from Lhasa after finishing 8 days group tour. Tour starts early in the morning from Kathmandu. It is 7 hours driving to Nepal Tibet boarder called Rasuwagadi. 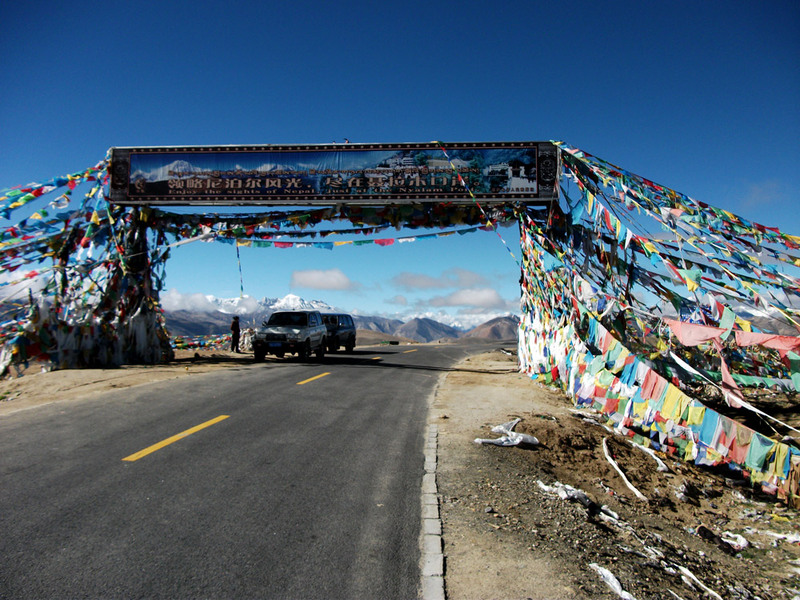 Enter Tibet and reach at Kerung within same day. Drive to Lhasa via Tingri, Lhatse, Shigatse and Gyantse. Picturesque scenic landscape of Tibetan plateau with panoramic Himalayan views including world’s highest peak Mount Everest north face from several high passes of over 5,000 miters. Visit major historical places Tashilampo Monastery in Shigatse, Potala Palace in Lhasa, Norbulinka palace, Drepung monastery, Jokhang temple. Walk inside old and typical Tibetan market Barkhor squire of Lhasa. At the end of tour, our representative drop either to Lhasa train station or to Gonggar Airport. Further exit from Tibet. 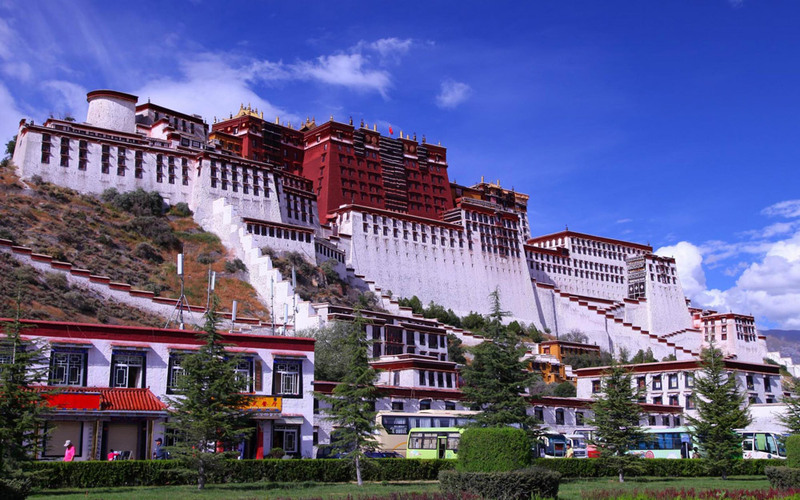 Special note of Tibet Visa: Tibet visa and Chinese visa is different. When you travel Tibet from Nepal, you only need Tibet visa that comes in paper and we do look after this entirely. Tibet visa also called group visa but it can make separate paper individually so that after 8 days of our tour, peoples can travel separately to mainland China and back to Kathmandu by flight. The maximum duration of this visa is for a month. If you already have a Chinese visa in your passport that get cancelled by Chinese Embassy Kathmandu when we apply for Tibetan visa. Visa procedure takes three working days and for this purpose we need your original passport, recently taken visa picture and fill an embassy form. Once we get Tibet permit from TTB we only than allow to go for visa. Minimum 2 week time is require to get Tibet travel permit. With this reason. we require your booking confirmation with passport copy at least before a month. With this same Tibetan visa, you also can travel mainland China up to its valid date, if you need more days in China than valid Tibetan visa, you have to extend it immediately after you land at China. There are 31 nationalities which are not able to get Tibetan visa and permit from Nepal. 31 nationalities who does not get Tibet travel permit and Visa. 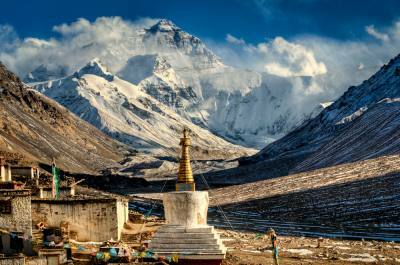 Add Everest Base Camp with this 8 days trip: You have option to add Everest Base Camp in this tour. Extra cost of USD 200 per person including extra transportation and EBC permit. There should be at least 4 peoples group ready to share EBC tour. Tibet overland tour group is collection of travelers from Nepal and send them together. So that there could be more numbers of peoples travelling together in this type of tour. Getting 4 peoples interesting for EBC is easy most of the time. It should be inform early before tour staring so that we can make ready EBC permit and so on. Plan it immediately after starting your tour in not able to make it. 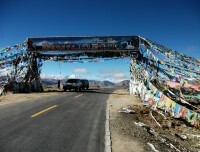 It is driving towards main cities of Tibet. Shigatse is the second largest city after Lhasa. Driving road crossing through high passes. Picturesque Views of Mountain, Lakes, and scenic landscape. If we reach earlier in Shigatse option to visit Tashilampo Monastery. Visit Tashilhunpo Monastery before leaving to Lhasa, the traditional seat of the Panchen Lama who is the second holiest man in Tibet. He is equally important religious figure in Tibet as the Dalai Lama. Today is short driving at high altitude. Arrive at Gyantse and visit the Palkhor Monastery. After your breakfast in Hotel, our guide will lead you day sightseeing around Lhasa City. 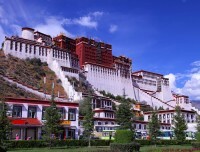 Visit famous Potala palace, Residence of Dalai Lama. Sera monastery. Sera Monastery is one of the "great three" Gelug university monasteries of Tibet. From late afternoon you will have time to exploring Lhasa city. After your breakfast in Hotel start to visit Drepung monastery, is one of the "great three" Gelukpa university monasteries of Tibet. Another visit is Jokhang Temple which is Buddhist temple near Barkhor market and walks around Barkhor market. Barkhor market is old and typical market of Lhasa. Our guide will transfer to either at Lhasa train station or drive to Gonggar Airport. Back to Kathmandu is by flight. Flight is either with Air China or with Situan airlines. Accommodation in Tibet Tour is in hotels and Guest house. 4 nights of accommodation is in twin sharing hotels and 2 nights at Xegar and Nyalam is in local guest house. Deluxe and super deluxe accommodation in main cities of Tibet is available. You also have option to upgrate your accommodation with extra cost. Transportation is in private bus or van. It depend on group size. Nepali transporation from Kathmandu to Kodari boarder. Tibetan transporation in Tibet part. Overland Tibet Tour package included every morning breakfast. You will get breakfast from the same hotel you staying. Restaurant for Lunch and Dinner can choose by your own. our Tibetan guide may suggest you good place as per your interest. Tibetan cities have choices of Chinese and continental restaurants. First day at Nyalam and second day at Xegar may get only Chinese and Tibetan style restaurants. You can buy bottled mineral water in the entire tour. Although water at Lhasa is more reasonable cost. We suggest you to buy water packets of your entire tour in Lhasa. It is good in high altitude to drink at least 3 litters water per day. Clean toilets are inside of your rooms in Lhasa, Shigatse, Gyantse. Similarly clean toilets are in Xegar and Nayalam but outside of room. There will be Guide and Driver as a staffs. The entire trip is handled by a professional Tibetan Guide. Guide speaks enough English. Due to the health problem or any other problem, if anyone needs emergency evacuation that cost is the extra cost and all the expenses go to the person. We arrange all the needful services. Helicopter rescue in Tibet part is not allowed. Rescue have to done by driving. There are hospitals in main cities like Lhasa and Shigatse. Ronbuk doesn't have any facilities of hospital and medical. Tibet Tour group size can by any in number. it is group joining tour mixed all nationalities. The entire tour is facilitated with local telephone. Wifi services available at hotels in main cities but not in the guest house in Ronbuk. You also can buy Chinese SIM card in your own name for your mobile. Physical fitness is an important factor to make your trip success. But we do not need any doctor or medical certificate to obtain your Tibet permit and Visa. Acclimatization in this tour is important and need before reaching at high altitude immediately or so fast. Our overland tour itinerary have short driving and spend more time in every cities so that it is helpful to acclimatized in hight altitude. Tour in Tibet and its itinerary is fixed in group joining tour. Individually, you can not extend your Tibetan visa to stay longer in Tibet. Extra activities in Lhasa can fixed by any tourist group, but there should be present of Tibetan guide. it may contain extra cost. Best season for Tibet tour is from April till September month. Although rest of the months like Octoberbet to February still suitable. Extra expenses in this tour is your Lunch and Dinner. Accept that personal shopping and personal expenses. Bottle drinks including drinking water is also in your extra expenses. You need one big bag to put your stuff, that goes separately in back side or roof of the bus/ Van. One another small bag need to put your important documents, water bottles and other accessories that you need during day time. You need comfortable warm shoes for entire Tour. Another spare shoe or sandal is needed to wear while staying at Hotel/guest house. 3 pairs of warm shocks are enough for entire trip. You can wash it in middle of your tour. Warm Head cover hat, Mouth covering muff, Warm down jacket, Wind proof jacket, Warm inner thermal, 2 pairs light T shirt, Warm sweeter or light weight jacket, Inner down thermal, Water and wind proof trouser, One long wear warm paint, Water/ wind proof warm glove, 3 pair comfortable underwear, Down sleeping bag. First Aid kit box containing Paracetamol, bandage, antiseptic cream, Diamox or other tablet for altitude sickness. Small trekking knife, Some dry foods, Camera and its extra batteries, Mobile, and charger with small multi pins. - We need your original passport before two days of tour starts in Kathmandu. - USD 200 per person at the time of confirming your tour. Rest of the amount can pay before starting off your trip. we can discuss mode of payment. - Accommodation in this tour is the budget type of. upgrading it is possible with your extra cost. - Canceling your tour before 2 months is free cancellation but if we need to issue your air ticket from Lhasa to Kathmandu, there will be cancellation charge.